DataSafeGuard (DSG) provides real-time disaster recovery, system analysis, security and replication services for your most important asset  your data. DSG logs transaction journals in real-time for any I/O that alters your Thoroughbred Database. Detailed information including Who, What, Where and When for each transaction is recorded as changes occur to your database. For public companies or anyone requiring Sarbanes-Oxley (SOX) compliance, DSG is a must. In the event of a system failure or breach, database transactions can be analyzed and played back to restore the system to its last good state. DSG can replicate specified data to a backup system or database to provide a "hot" swap or redundant/mirrored backup. DSG can replicate your data to other databases including MS SQL Server and ORACLE as well. Data recovery is of paramount importance today. Even the slightest system failure, hardware or software, will require precious time and resources to recover data and can result in lost revenue and information. Numerous solutions are available in the marketplace. The most common is the hardware solution using hardware replication, including expensive RAID sub-systems and network clustering. These systems work well in replicating blocks of disk I/O. Unfortunately, these systems have no knowledge of the database transaction and the relationship of the data to the key structure. If a failure occurs during such a transaction the resulting back up will replicate the error(s) causing what could be many hours of analysis to find and correct. Using the DSG Journals, DataSafeGuard provides detailed information that can be used to analyze data perspectives including user, file and program. This information can track data changes detailing every transaction that changes or modifies your database (Who, What, Where and When). Public Companies requiring Sarbanes-Oxley compliance can rest assured that any transaction is fully recorded and can be available for review and rollback as necessary. The Log Journals can be retained for any amount of time for future reference. Updates that do not conform to the table/File (FORMAT) definition can be logged. DataSafeGuard can replicate your data to backup databases including Thoroughbred, ORACLE and MS SQL Server. Many DSG backup servers are hosted at remote locations providing another level of data security and recovery. Replication can occur as a defined Journal programmed update, or on-the-fly providing a virtual copy of your primary database. Multiple disparate databases can be updated simultaneously with DSG's Replication capability and the appropriate Thoroughbred TS DataServer. The Playback utilities can also be used in a bi-directional mode keeping multiple Primary servers synchronized. Transaction conflicts between the multiple servers are analyzed and the proper database updates are made. A new 3-way playback is also now available. Thoroughbred's DataSafeGuard provides the solution by supporting transaction level journaling without incurring any significant performance overhead because only the modified data is saved. DataSafeGuard's journaling process not only records all file creations and Writes/Removes, but also identifies whether the Write is a new record (Insert/Add) or an existing record (Update/Change), and logs the user information and pre and post values. DataSafeGuard records the activity at the Thoroughbred Environment level and requires NO program changes to existing applications. Capturing transactions in the Journal is only the initial step in providing disaster recovery and incremental backups. For many installations the current data recovery process includes restoring the last good backup and manually re-entering daily transactions. This solution really isn't practical as it leads to unnecessary downtime and is prone to errors as operators try and repeat their work, usually under less than ideal conditions. DataSafeGuard reduces the downtime and insures accuracy of the previously entered data. Rather than having operators re-enter transactions, the DataSafeGuard On-Demand Replicate or PlayBack utility will restore transactions from a specified time. More sophisticated systems can opt for the Real-Time Replicator that can automatically replicate the data on a Target or Backup Server. In this configuration the Backup Server can become a "Hot" backup in case of emergency and a Data Warehouse for reporing and analytics. Recording necessary data I/O components required for recovery, data analysis and security. No program changes required. Any Thoroughbred installation can be monitored and recovered quickly and easily. Can help compliance with Sarbanes-Oxley Compliance requirements. Playback recovery can be On-Demand or Real-Time. Real-Time providing a "Hot" Backup. 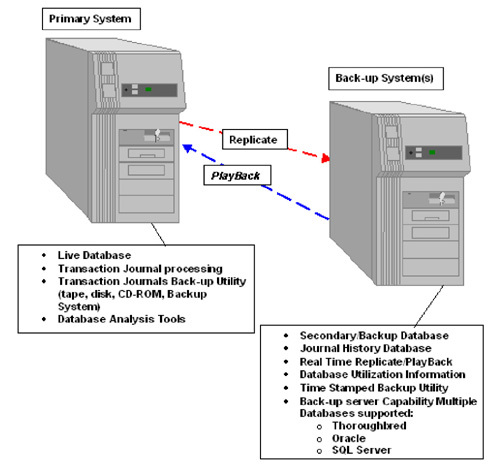 Backup Servers can be deployed with Replicate/Playback on either Local and/or Remote Servers. Replication will support multiple disparate databases including Thoroughbred, ORACLE and MS SQL Server with the appropriate Thoroughbred DataServer. Database utilization and analysis tools to determine Who/What/Where/When. Read only access of the database with tools like TS ODBC DataServer. Track specific table/file updates flagging non-conforming changes or entries. Data Warehouse for reporting and analytics. DataSafeGuard enables recovery or analysis by loading the system backup and using the on-demand Replicate/Playback utility to apply the affected transactions. This will require a storage system suitable to store the Journal data. Real-Time ODBC file access off line. Incremental 24x7 system support, maintenance and backup, leaving the Primary system UP. Can function as a temporary Primary server during scheduled maintenance for the original Primary server. Analysis tools can be used to determine data integrity. Backup to a non-Thoroughbred Database, i.e. ORACLE or MS SQL Server. DataSafeGuard is ready to protect your system today. Close the loop on open recovery and analysis issues, and beat the odds with Thoroughbred's DataSafeGuard. Depending on the configuration, certain Thoroughbred Training, Services and Hardware may be required or offered, to assist in the installation and support of DataSafeGuard. Please call your Thoroughbred Sales Representative.